A magical world awaits at Universal Studios Japan! 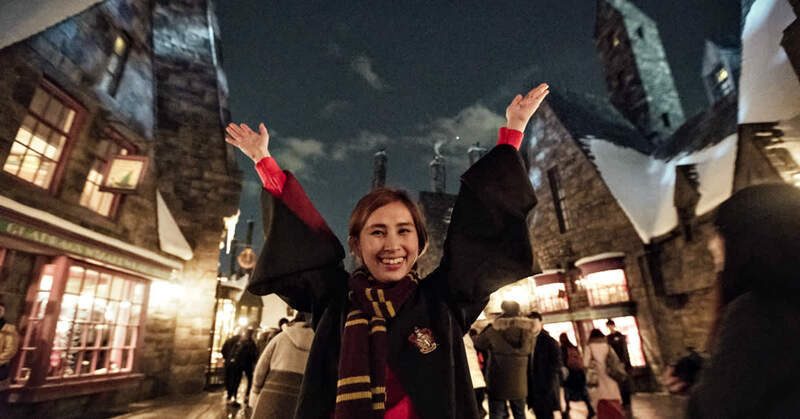 You can’t visit Osaka and NOT visit Universal Studios Japan, but with so many other like-minded tourists and locals thinking the same, planning a trip to one of Japan’s favorite theme parks can prove to be quite the nightmare! The Klook Team recently had the chance to visit this amazing place and here are some insider tips and tricks of our own! 1. What time does Universal Studios Japan open? Universal Studios Japan’s opening hours vary a lot between seasons so it’s best to check the official website for the most up to date information. Alternatively, you can purchase the Universal Studios Japan VIP Wristband* for insider information on park opening hours and front of line admission for certain rides! With this wristband, you’ll receive an email a day before alerting you of the opening times so you are among the first to enter the park through the VIP line. Additionally, you also get access to view Osaka’s skyline from the tallest building in Japan, HARUKAS 300. Universal Studios Japan typically opens between 8:30am and 9:30am and closes between 7:00pm and 9:00pm with longer opening hours on weekends and public holidays. *Do note the VIP Wristband has to be collected from HARUKAS 300 the day before your intended Universal Studios Japan visit. 2. 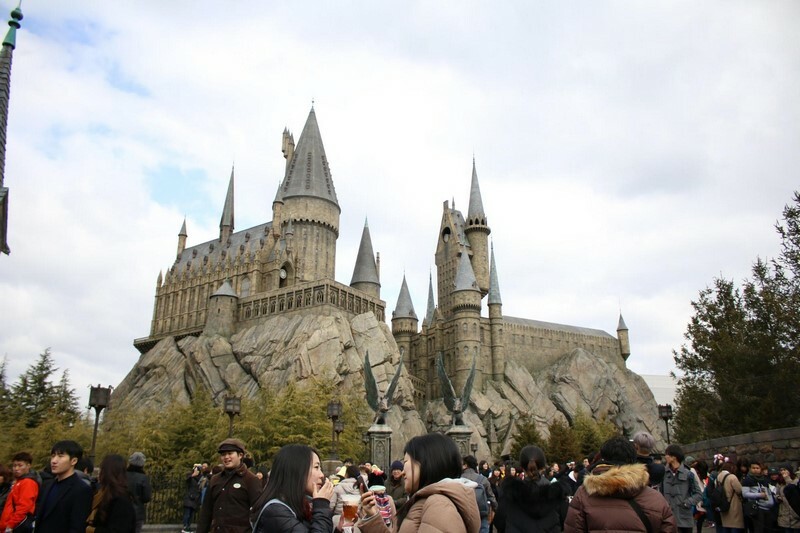 When is the best time to visit Universal Studios Japan? Wednesdays and Thursdays are the best days to visit as crowds start to stream in from Friday till Tuesday. While Universal Studios Japan sees huge traffic throughout the year, it is less crowded in January and inbetween June and July when the park undergoes a theme change. Most shows and parades do not run during this period, which might explain the smaller crowds. 3. What time is the last ride? Rides typically close at 6.30pm, though shows and experiences like Ollivander’s run till approximately 7pm. 4. Can I bring food from outside into the park? Nope! 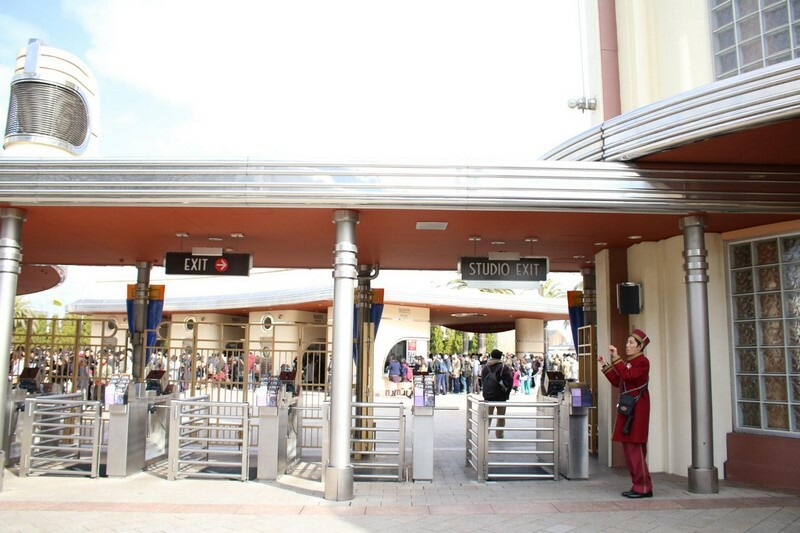 Stringent bag checks are conducted at the entrance of Universal Studios Japan and all prohibited items will not be allowed on park grounds. 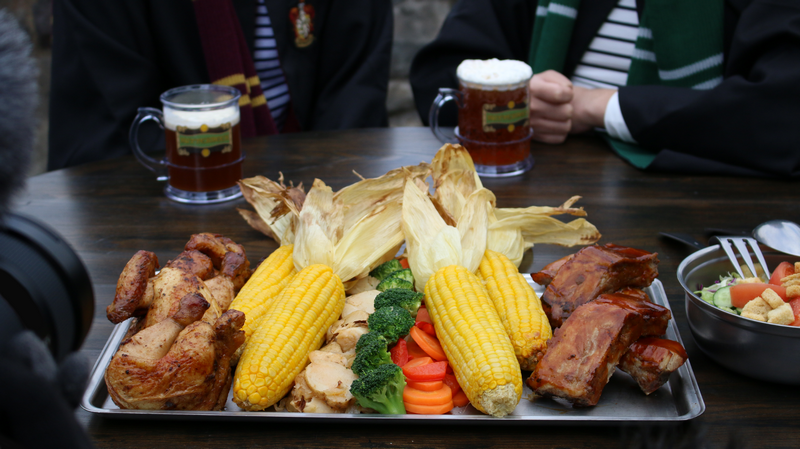 Universal Studios Japan is definitely not short on mouth-watering food options including this delicious food platter from The Three Broomsticks! 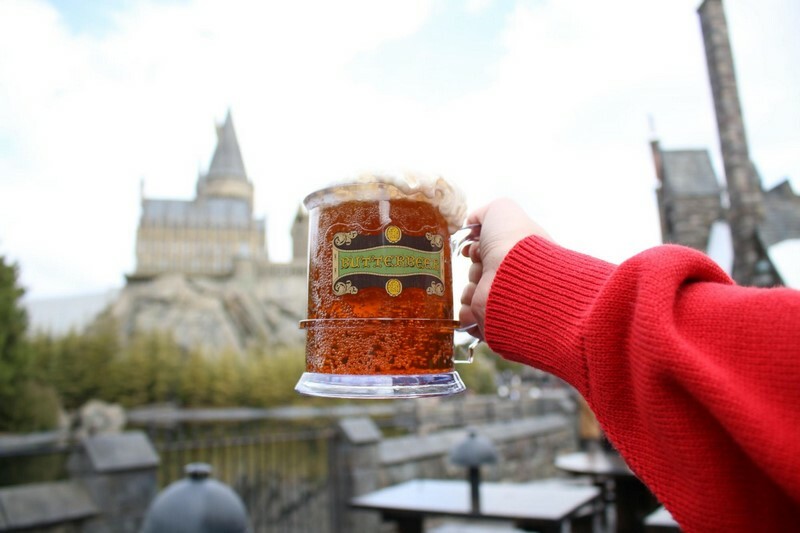 Not forgetting the famous Butterbeer which tastes every bit as delicious as it sounds. Visitors get to pick from three varieties: hot, cold or frozen (available in Summer). We didn’t get to try the frozen version, but the hot version came with a hint of ginger and was much sweeter than the cold version. 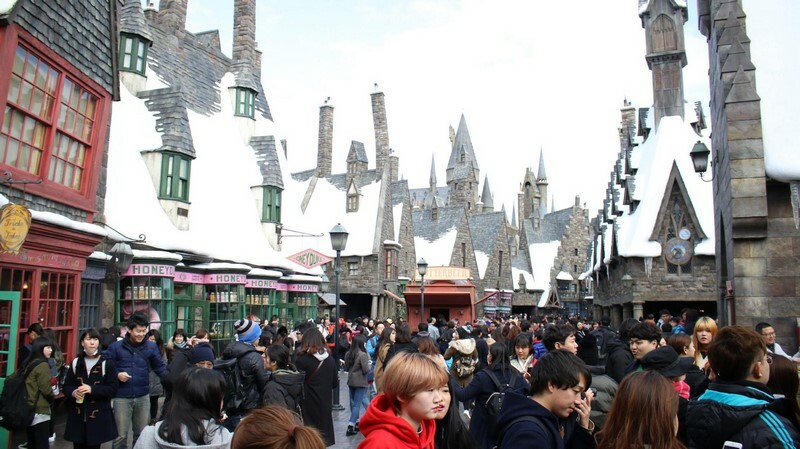 Klook Pro-Tip: There are two Butterbeer carts in The Wizarding World of Harry Potter – skip the one closer to the entrance and head for the less crowded one nearer to The Flight of the Hippogriff instead for significantly shorter waiting times! Not up for something so heavy? Cute snacks abound that are almost too adorable to eat! Check out this talking Minion popcorn bucket for instance that shouts “BEEDO!” and comes filled with chocolate banana popcorn (and other seasonal flavours) and its own little teddy bear! 5. How long do I need to wait at each attraction? Waiting times vary from five minutes to a whopping two hours, so be prepared to wait especially for more popular rides like The Flying Dinosaur and Harry Potter and the Forbidden Journey™ in 4K3D. Can’t wait? No worries! 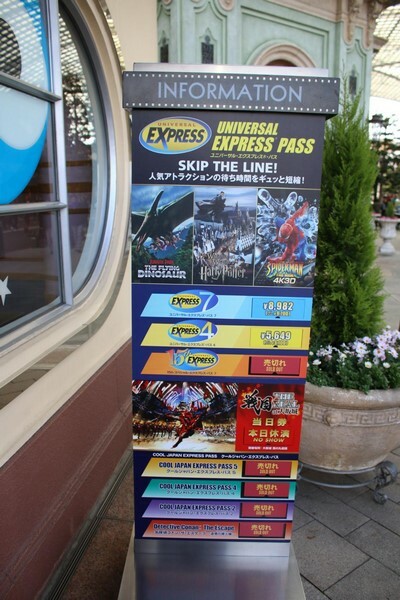 Express Passes will help you to make the most of your trip to Universal Studios Japan. 6. How do I get my hands on Express Passes? Don’t push your patience to its limits, jump to the front of the lines with an Express Pass. You have the option of purchasing a pass that works for 4 or 6 or 7 Universal Studios attractions. 7. When are the special performances and parades? 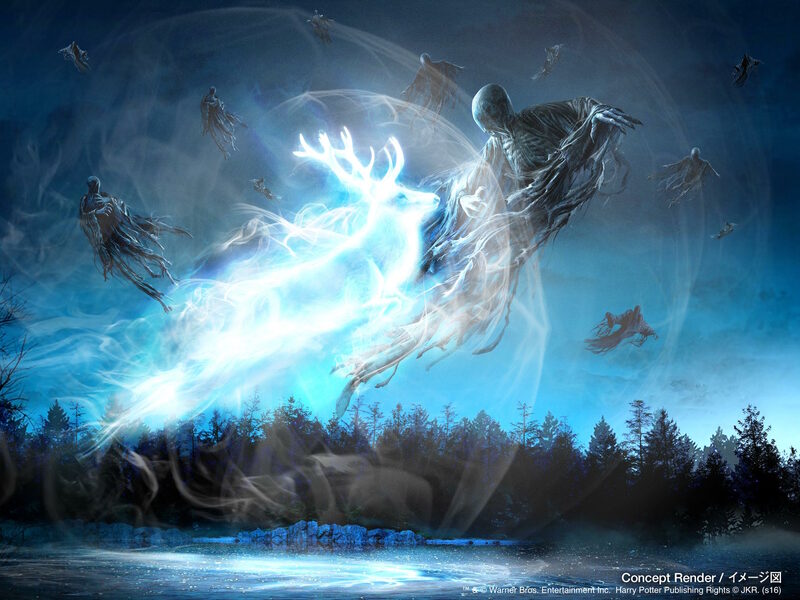 Good news for Harry Potter fans – starting this April, USJ will debut a large scale night show that features the students of Hogwarts battling off Dementors across the Black Lake. A true performance that will thrill both the fans and non-fans alike, this night show will be guaranteed to leave you at the edge of your seats. The light show, which will go on till November 2017, will consist of state-of-the-art technology, producing a never before seen look inside The Wizarding World of Harry Potter. Also, there will be new Wand Magic locations in the park where guests can cast spells at. Wand Assistants will also be around to guide you through your new spells! 8. Where can I buy tickets online? Tickets can be purchased at the Universal Studios ticket booths near the park entrance, partner hotels or via official partners like Klook. You can also purchase the Express Pass here on Klook, even if you have already purchased your own tickets. Re-entry is restricted – once you leave, there’s no going back in. 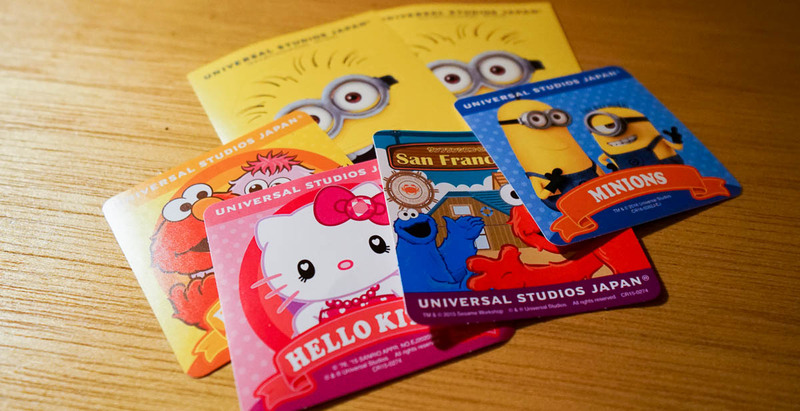 Note: Only purchase your Universal Studios Japan tickets from an official partner. Tickets purchased from external sources that are not official partners of the park may be denied. 9. What is Timed Entry? 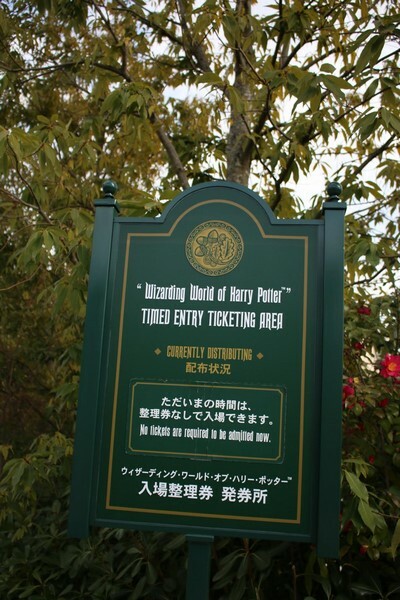 During peak periods you will need a Timed Entry Ticket in order to enter the Wizarding World of Harry Potter. You’ll be able to obtain this ticket before your visit, or on the day of admission. Purchasing an Express Pass beforehand will give you access to The Wizarding World of Harry Potter. includes the timed entry ticket (except for Express Pass 4 – Flying Dinosaur). 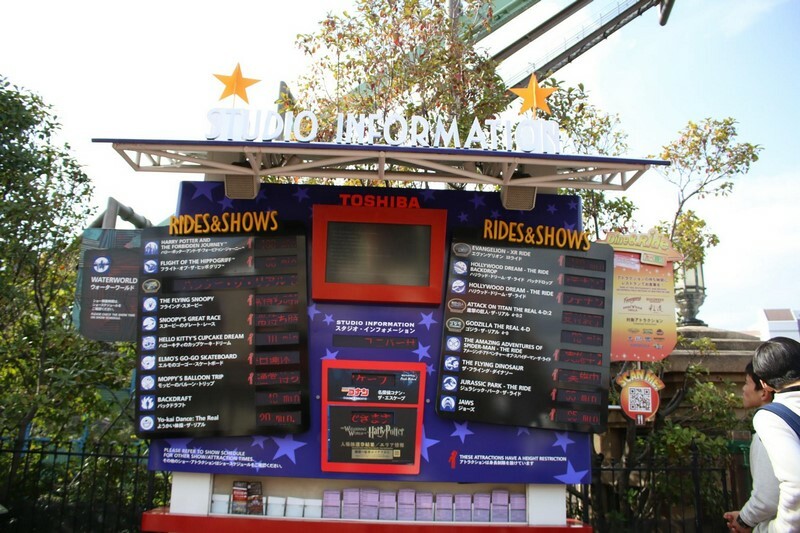 To get the Timed Entry tickets on-site, proceed to the ticketing site at Central Park inside Universal Studios and get it for free. The ticketing site is located next to Jaws, the big shark statue (see map above). The machine requires you choose a desired time of entrance. Get your ticket and make your way to the Wizarding World of Harry Potter once the chosen time comes. Remember that this ticket can only be used at designated times and once you miss your slot, the ticket cannot be re-issued. To ensure you have the best chances of getting in, make sure to go to the ticket machines as soon as you enter the park! 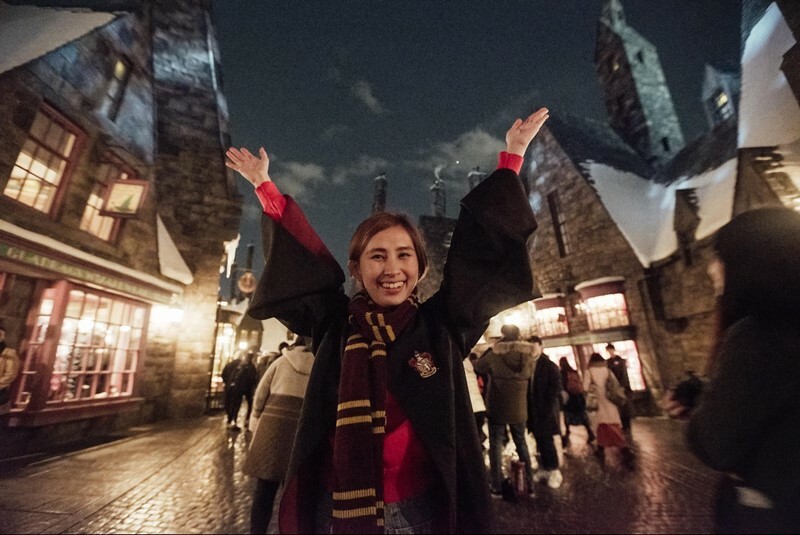 Klook Pro-Tip: Purchase the USJ VIP Wristband as an add-on and be one of the first few in line for The Wizarding World of Harry Potter! 10. What’s in the Minion Park? 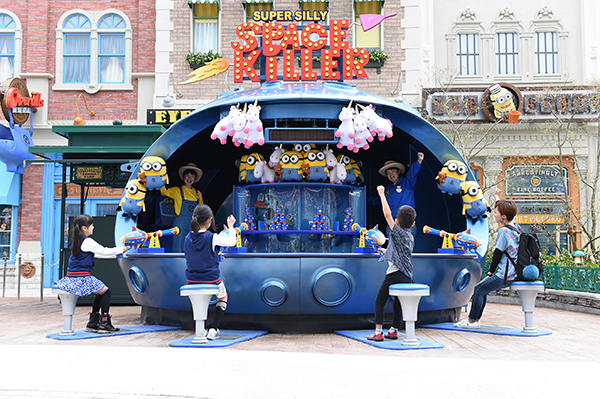 Between the New York and Jurassic Park themed lands, sits Universal Studios Japan’s latest addition, the Minion Park. 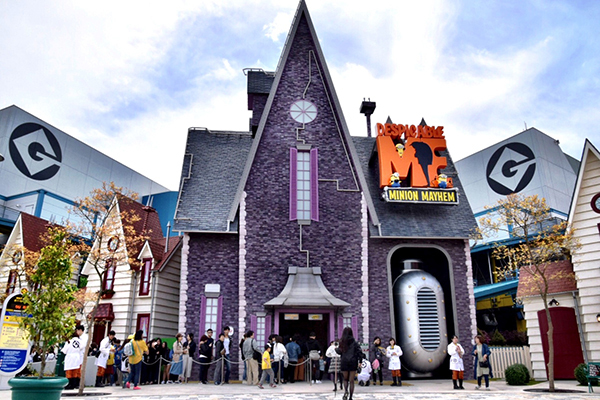 Recently opened in April, the park features attractions like the Despicable Me Minion Mayhem 4D ride, Minion-themed eateries, goods stores, playlands, and designated photo op areas. 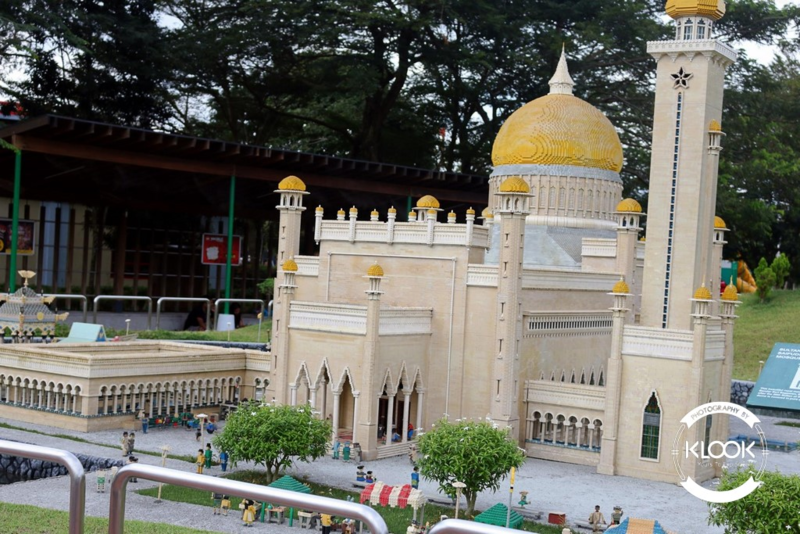 Being the newest and largest Minion Park in the world, it’s incredibly popular with visitors. It’s absolute Minion mayhem at the park, so best is to head there as soon as the park gates open if you want to beat the crowd! You can also purchase the USJ VIP wristband to make sure you’re one of the first ones in. 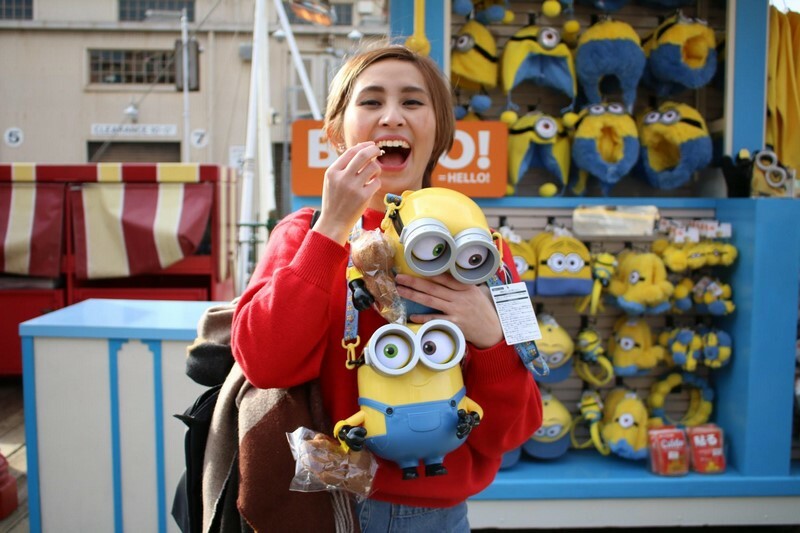 The Minion-themed snacks and tidbits will also have you catching the Minion fever (if you haven’t already, that is). You can find giant Minion-inspired cookies and banana-flavored popcorn that comes in the cutest Minion popcorn bucket to fill not only your tummy, but also all of your heart’s Minion desires. The Hacha-Mecha Snow Party, which is running now till 3rd September 2017, is also worth catching. This street show allows visitors to get up close and personal with their favourite Minions. With snow and icy water during the Japanese summer and the Minions up to their usual antics, it sure promises an unforgettable experience! 11. When are the fireworks? Universal Studios Japan only has fireworks on special occasions such as New Year’s Eve or Christmas Day. There aren’t any fireworks on regular park opening days, but visiting The Wizarding World of Harry Potter in the evening is highly recommended. In the darkness, the street looks even more magical with soft lighting from the shops and animated objects moving about in the windows. 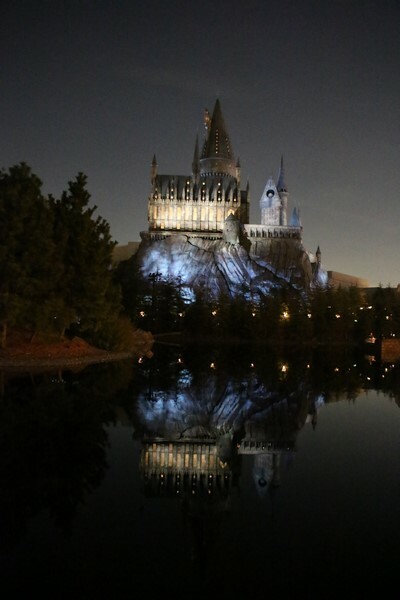 Plus, the view of Hogwarts Castle at night beats fireworks on any given day! Klook Pro-Tip: The best picture you’ll get of Hogwarts Castle isn’t in front of it but from the outdoor courtyard of The Three Broomsticks where you’ll be able to capture the castle together with its reflection on the Black Lake (the only one in the world!). 12. Where can I get USJ special stickers? This may not be a very well-known fact but you can actually get free special stickers throughout the park! Souvenirs can get pretty pricey, so these stickers are great as mementos. Look out for staff members and if you ask them nicely, they will most likely give them to you. Not all staff members carry the stickers with them though, so try to find the ones with a fanny pack. Also, if it’s your birthday, you get a special sticker as well! 13. How do I get there? 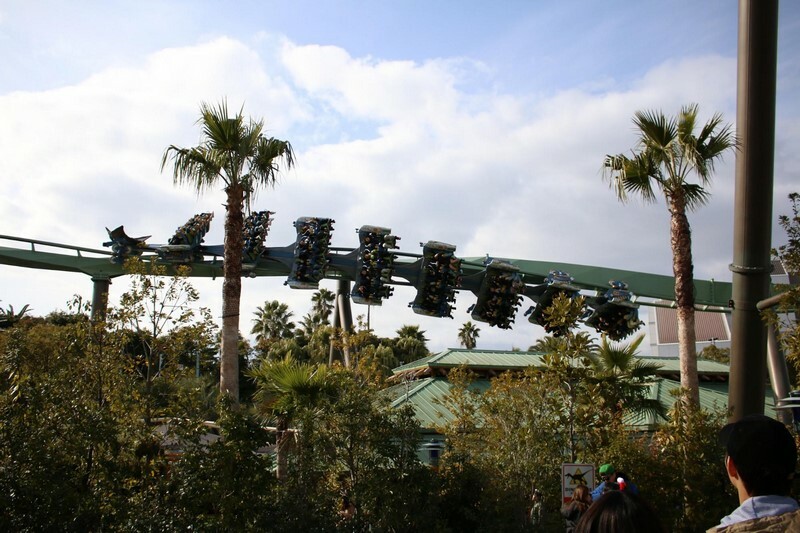 The theme park is a 5-minute walk from Universal City Station (JR Yumesaki Line). Enjoy unlimited train rides, food discounts and free entry to 30 attractions in Osaka with the Osaka Amazing Pass! Don’t forget to pick up some WiFi and share all your memories with your loved ones! KLOOK ME TO UNIVERSAL STUDIOS JAPAN! If you have your own tips and tricks for visiting Universal Studios Japan, please share them with us in the comments section below!